Objects in the Rear View Mirror is Now Available!!! 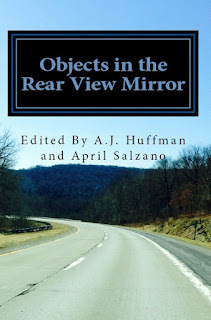 In creating the third anthology of 2015, Objects in the Rear View Mirror (188 pages), Kind of a Hurricane Press asked our authors to let their imaginations rev up the highways and cruise down the backstreets of their minds. As always, our authors filled our literary parking garages with amazing work. So roll the windows down, turn the radio up, and enjoy poetry and fiction from the open road. We believe Objects in the Rear View Mirror will take you on a journey to some place uniquely interesting. Enjoy.